The German Federal Government aims to foster pioneering research with a wide range of application possibilities. The new German Agency for Disruptive Innovation is to promote innovations with radically new technologies and a great potential to change the market with new products, services and value chains. Dietmar Harhoff has been appointed chair of the commission for the establishment of the new agency by the German Federal Minister of Education and Research Anja Karliczek and the German Federal Minister for Economic Affairs and Energy Peter Altmaier. Further members of the commission are: Dr. Nanne Diehl-von Hahn (Telefónica Germany), Sabine Herold (DELO Industrie Klebstoffe), Dr. Ingmar Hoerr (CureVac AG), Prof. Dr. Achim Kampker (RWTH Aachen, streetscooter GmbH), Dr. Stefan Kaufmann MdB, Andreas König (ProGlove), Rafael Laguna (Open Xchange), Alfred Möckel (Alubi Capital GmbH), Dr. Manja Schüle MdB, Catharina van Delden (innosabi GmbH), Prof. Dr. Birgitta Wolff (Goethe University Frankfurt/Main). For further information, visit the websites of the German Federal Ministry of Education and Research (in German) and the German Federal Government (in German). Fifty years ago, shortly after the establishment of the Max Planck Institute for Foreign and International Patent, Copyright, and Competition Law in 1966, Eugen Ulmer as its founding director and Friedrich-Karl Beier, then assistant director, decided to launch IIC as a journal published entirely in English on intellectual property law. IIC — at that time titled the “International Review of Industrial Property and Copyright Law” — was to supplement the already existing German-language journal GRUR Int., also managed by Eugen Ulmer and Friedrich-Karl Beier as editors, yet in co-operation with the Deutsche Vereinigung für gewerblichen Rechtsschutz und Urheberrecht (GRUR). The idea to expand into other regions of the world through a purely English-language journal, parallel to GRUR Int., proved to be a wise decision. In some regions — especially in Continental Europe and Asia — it was still common for IP lawyers to learn German and use it as a publication language. In the years to come, command of German became even more important for scholars who sought to excel in IP law, since it facilitated a research stay at the Institute and, above all, a doctorate at the University of Munich. Yet, given the very dynamic development of international IP law during that period and the growing belief that European IP rules would be needed in times of economic integration, it became essential to go beyond enhancing scholarship among German speakers and to address the international community in English as the new lingua franca with the objective of inﬂuencing the future directions of scholarship in international and, soon to be, European IP law. In terms of content, IIC initially focused on comparative law studies and the revisions of the IP Conventions with the aim of expanding intellectual property protection. Yet, as early as the 1970s, IP scholars, not least from the Max Planck Institute, supported initiatives to establish more integrated European protection systems, with the European Patent Convention of 1973 as the most notable achievement. Moreover, IIC provided a platform for scholarly debate at a time when European harmonization of national IP laws and the adoption of legislation on the ﬁrst unitary protection systems gradually became a reality in the late 1980s. On the international level, the establishment of the WTO in 1994 and the adoption of the TRIPS Agreement exported standards previously accepted in the industrialized world to major emerging economies, such as India, China and Brazil, but also a large number of smaller and often less developed countries. At the same time, the criticism of these standards of protection, which were not necessarily in the interest of less developed economies, was quickly growing both in the recipient countries and among the global academic community. These tensions are partly reﬂected in IIC’s 25th anniversary special issue compiled by members of the Institute (see IIC 6/1995). The critical debates on international IP have continued ever since, with IIC becoming an important forum for the most diverse voices. In this journal, advocates of expanded protection as well as its critics had their say — provided that the scholarly quality and independence of a contribution were guaranteed. Today, thanks to a large, stable and extremely dedicated network of reviewers, IIC is now a peer-reviewed journal, guaranteeing the highest standards of quality control and impartiality with an acceptance rate of a mere 20 per cent. IIC is currently published nine times a year by Springer – with plans to further increase in the years to come. Another reason for its success was the decision of the current Editors-in-Chief to expand the journal’s subject areas by including competition law, not only to reﬂect the broader ﬁelds of research at the Institute, but also to take into account the quickly growing importance of competition-related issues of intellectual property. Accordingly, the journal was renamed the “International Review of Intellectual Property and Competition Law”. As the two Editors-in-Chief, Josef Drexl and Reto M. Hilty say: “In times of bilateral or plurilateral trade agreements, which economies with strong bargaining power, often in the interest of individual industries, use to impose unbalanced TRIPS-plus Standards on less developed countries, the international community should develop answers together in order to create a generally binding and sustainable regulatory framework. In this context, the existence of recognized journals which are not oriented toward the short-term mainstream, but committed to taking up basic research topics with a long-term perspective, thereby providing a forum for independent academic analysis is invaluable to ensure a balanced and competition-oriented IP system on the national, regional and international levels”. 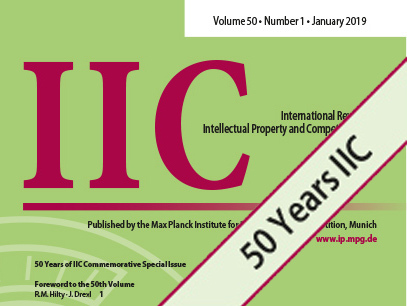 For the ﬁrst issue of IIC’s 50th volume, researchers from the Institute have undertaken to delve into some particularly topical challenges, which will also most likely ﬁgure highly among the Institute’s research priorities in the next few years – such as “Artificial Intelligence and Collusion”, “IoT Connectivity Standards: How Adaptive is the Current SEP Regulatory Framework?” and “Copyright Law on Blockchains: Between New Forms of Rights Administration and Digital Rights Management 2.0”. f.l.t.r. : Prof. Dr. Christoph Böhringer, Prof. Dr. Katharina Hölzle, German Federal Minister of Education and Research Anja Karliczek, Prof. Dr. Monika Schnitzer, German Chancellor Angela Merkel, Prof. Dietmar Harhoff, Ph.D., Prof. Dr. Uschi Backes-Gellner, Prof. Dr. Uwe Cantner. Photo: David Ausserhofer. The Commission of Experts for Research and Innovation (Expertenkommission Forschung und Innovation - EFI) provides scientific advice to the German Federal Government and periodically delivers reports on research, innovation and technological productivity in Germany. A key task is to provide a comprehensive analysis of the strengths and weaknesses of the German innovation system in an international comparison. Furthermore, Germany’s perspectives as a location for research and innovation are evaluated on the basis of the latest research findings. EFI presents proposals for national research and innovation policy. Core topics of the report 2019 are start-ups, energy transition, blockchain, and digitalization in German tertiary education institutions. New concept for the newsletter: The Institute informs quarterly about research results, events and new publications. The Institute wishes its former director a happy 80th birthday. Straus, one of the most distinguished figures in the field of intellectual property law, is active primarily in patent law. On December 14 Prof. Dr. Dr. h.c. mult. Joseph Straus will celebrate his 80th birthday. He has for decades been one of the world's leading and most respected research personalities in intellectual property law with a clear focus on patent law. After completing his law studies at the University of Ljubljana in 1962, Joseph Straus moved to Munich. As the first doctoral candidate of Friedrich-Karl Beier, he obtained his doctorate in 1968 at the University of Munich with a dissertation on competition law in Yugoslavia. In 1977, Joseph Straus took over the Yugoslavia Department at the Max Planck Institute for Foreign and International Patent, Copyright and Competition Law under its director Friedrich-Karl Beier. After his habilitation at the University of Ljubljana in 1986, Joseph Straus was appointed titular professor there in the field of intellectual property law. At the beginning of the 1990s, Joseph Joseph Straus also taught at the Law Faculty of the University of Munich, where, to this day, as an honorary professor, he continues to supervise a large number of doctoral students. Joseph Straus earned his worldwide reputation as a legal scholar first and foremost through his intensive research on forward-looking topics, primarily in patent law, at the Max Planck Institute. In 2001 he was appointed Director of the Institute - where he joined the sitting Director Gerhard Schricker. In managing the newly established Max Planck Institute for Intellectual Property, Competition and Tax Law in 2003 and 2004, he was not only responsible for repositioning the Institute to meet new challenges. He also took on the demanding responsibility of establishing the Munich Intellectual Property Law Center (MIPLC), with its internationally leading Master's Degree program in intellectual property law. In close cooperation with the University of Augsburg, the Technical University of Munich and the George Washington University in Washington, D.C., Joseph Straus led the MIPLC until his official retirement from the Institute in 2008. The success of this one-year degree course in its first 15 years, and the program's enormous international appeal, are due not only to a worldwide network of over 300 alumni but also in large part to the enthusiasm and strategic skills of its founder, Joseph Straus. Retiring to a contemplative, private life is not in the nature of Joseph Straus. He continues to publish widely and is still a highly requested speaker at conferences all over the world. Among his many foreign research and teaching positions, consultancies in international organizations and activities in scientific organizations and societies, those deserving particular mention include his visiting professorships at Cornell Law School (1989 to 1998), the University of Toronto (2005), George Washington University in Washington, D.C. (2001 to present) and Tsinghua University in Shanghai (2015 to 2017) and his appointment to a research professorship (2011 to 2016) at the University of South Africa (UNISA). Joseph Straus is a corresponding member of the Slovenian Academy of Sciences and Arts (since 1995) and a member of the Academia Europea (since 2001). In addition, Joseph Straus was co-editor of GRUR Int. and President of the International Association for the Advancement of Teaching and Research in Intellectual Property (ATRIP) (1993 to 1995), longtime Vice President and member of the GRUR Executive Committee, and finally chair of the AIPPI Program Committee and chair of the Human Genome Organization (HUGO). His scientific advice has been requested by the OECD, WIPO, UNCTAD, the European Patent Office, the German Ministry of Justice and the Legal Service of the German Bundestag, as well as by the European Commission as a member of the Expert Group on Biotechnological Inventions. The award of the Science Prize of the Stifterverband der Deutschen Wissenschaft in the year 2000 stands out among his scientific honors. He was awarded an honorary doctorate by both the University of Ljubljana (2001) and the University of Kragujevac (2003). He was also honored by the University of Xiamen, Huangzhong University for Science and Technology (HUST) in Wuhan, and Tongji University in Shanghai as Honorary Professor. Joseph Straus is a bearer of the Grand Cross of Merit of the Federal Republic of Germany (2005) and of the Slovenian Order of Merit (2010). The Institute honoured its former director with a special event in the patent law lecture series followed by a reception on December 18. The evening’s speakers were close and long-term companions of the honoree. Prof. Dr. Rudolf Kraßer, Dr. Rainer Moufang, Prof. Dr. Bojan Pretnar and Wolrad Prinz zu Waldeck und Pyrmont spoke on particularly important topics of intellectual property law that are still a part of Joseph Straus’ research work today. Laura Rosendahl Huber und Laura Bechthold show how important role models are, especially for fostering female entrepreneurship: They play a key role for entrepreneurial thinking and behavior. 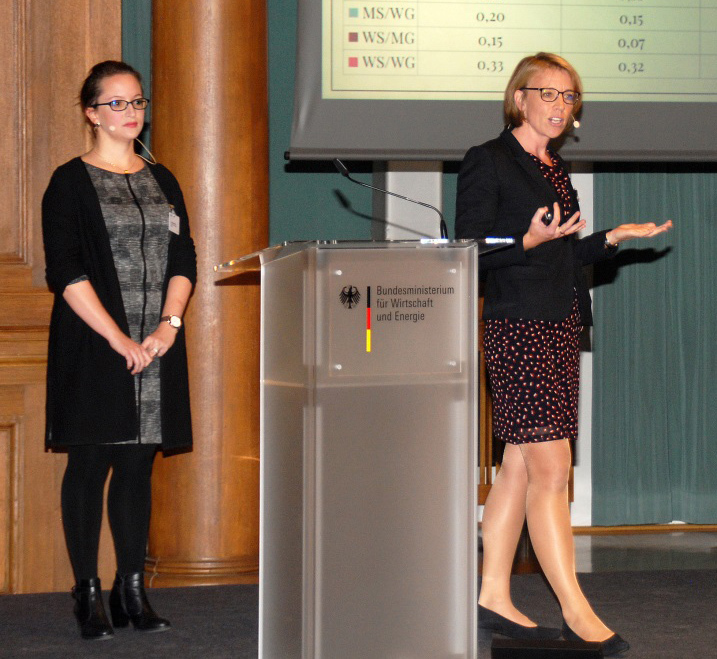 On Wednesday, 14 November 2018, Laura Rosendahl Huber, Ph.D. and Laura Bechthold have presented their research results in a keynote speech at the German Federal Ministry for Economic Affairs and Energy. Within the so-called “Gründerwoche Deutschland” (Startup Week Germany) the Day of Female Role Model Entrepreneurs was dedicated to the over 140 women entrepreneurs who voluntarily support an initiative of the Ministry and act as role models in schools, universities, or at public events to foster female entrepreneurship. Rosendahl Huber and Bechthold have examined how exposure to female entrepreneurial role models influences the development of entrepreneurial self-efficacy, attitudes and intentions among female students. Drawing on a field experiment and social learning theory as well as existing research concerning role model effects, the study provides evidence that role model effects do not only occur by chance, but can be purposefully triggered in an educational setting. Hence, exploiting female role model effects may serve as an effective mechanism to foster female entrepreneurship. In August 2018, the study has also received the Best Empirical Paper Award during the Entrepreneurship Division Business Meeting of the Academy of Management in Chicago. On this year’s Library Day, Peter Weber, Head of Library at the Max Planck Institute for Innovation and Competition and Tax Law and Public Finance, explains why the printed word will never become obsolete - especially in the age of e-paper, MetaGer and open access. What makes this library exceptional? Peter Weber, Head of Library (Credit: Axel Griesch). With more than 288,000 printed books and over 10,000 e-books the library at the Max Planck Institute for Innovation and Competition and the Max Planck Institute for Tax Law and Public Finance is one of the world’s leading specialist libraries. In an interview Peter Weber explains what a modern library in the age of e-paper, open access and MetaGer should be like - now and in the future. Library Day is celebrated in Germany on October 24th. You can find more information and posts at #meandmylibrary and #TagderBibliotheken. 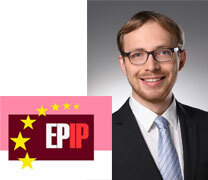 On Thursday, 6 September 2018, Felix Pöge received the EPIP Best Paper Award for Young Researchers for the paper “A Firm Scientific Community”. The prize is bestowed with 500 Euros and was conferred upon him during the EPIP 2018 Conference at the ESMT Berlin. Felix Pöge is Doctoral Student and Junior Research Fellow at the department Innovation and Entrepreneurship Research. The paper investigates the extent to which ﬁrms participate in scientiﬁc communities’ activities and whether this facilitates the exchange and transfer of scientiﬁc knowledge to ﬁrms’ technological activities. The focus is on two modes of interactions of ﬁrms with scientiﬁc communities: the participation in and the sponsorship of international scientiﬁc conferences. In particular, the focus is on the field of computer science. The paper is joint work with Dr. Stefano Baruffaldi, Senior Research Fellow at the Institute. First, the results document that both conference participation and sponsorship by firms is frequent and concentrated at events of the highest quality. Even within individual conferences, firm contributions stand out in quality. Second, firms are significantly more likely to cite in their scientific articles and patents scientific articles presented at a conference which they attended relative to articles presented at comparable conferences. To provide causal evidence, the authors use the fact that academic researchers are more likely to attend conferences whose locations they can access easier by airplane. Thus, at a conference, firms have a higher likelihood to observe research by researchers with a direct flight to that conference. EPIP (European Policy for Intellectual Property) is an international, independent, interdisciplinary, non-profit association of researchers with the objective to be a leading European platform for the analysis and discussion of intellectual property systems and intangible assets. EPIP encourages research regarding economic, legal, managerial, social, political and historical aspects of intellectual property rights at national, European and international levels. It contributes ideas, concepts and discussions that will promote innovation, productivity and growth in Europe and beyond and informs and encourages policy-oriented discussion involving political and administrative bodies and stakeholders in Europe. EPIP cooperates with other associations with similar objectives.